A Georgian man who killed a police officer in April this year and wounded several others, has been sentenced to life imprisonment by the Akhaltsikhe Court in southern Georgia. Convict Shalva Abuladze was found guilty of the murder and the attempted murder of four police officers by a judge. Abuladze’s lawyer, Shalva Khachapuridze, claimed that the verdict was unfair as it was unjust to send a man to life imprisonment for a single murder case. However, the defence has the chance to appeal the solution to higher authorities. Earlier 2015 Abuladze, was convicted of attacking two police officers in Borjomi, southern Georgia. On April 4, 2016 Abuladze shot dead a Georgian District Inspector-Investigator, Beka Margishvili, and wounded Assistant Detective Valerian Grdzelishvili in capital Tbilisi. 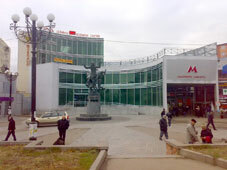 The two police officers stopped Abuladze in order to verify his identity near the Varketili Metro Station in Tbilisi suburbs. Upon the policemen’s order, Abuladze opened fire in the direction of the police officers and immediately fled the scene. Commenting on the incident at the time, Prime Minister Irakli Garibahsvili promised that a man committing such a heavy crime would be adequately punished. The law-enforcers arrested Abuladze on April 10 in a special operation in Borjomi, where Abuladze was hiding in an abandoned building. The Interior Ministry said the police found two handguns and a hand grenade at the scene.